Want to skip to the results? View the Digital Elite website HERE. The Digital Elite is a marketing agency who focuses on helping B2B technology companies to better engage with their customers. So far we’ve worked on 7 sites in partnership with Digital Elite over the past several years. 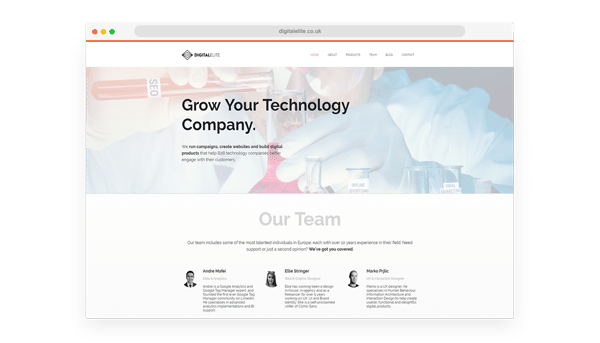 For most of that time, their website’s messaging was tailored towards cyber security companies; but as the business matured, so did their ideal target business. Which is where Affios comes in. The previous Digital Elite website worked as almost a holding page, with minimal content visible to users (but plenty being built up in the back-end). We were set the task to not only help rebrand and redesign the site, but to add a large number of features and content areas. The site required a strong focus on the businesses they serve, and the scale of their team’s skills. So we chose to use the homepage to sell this message from the get-go. With large, colourful fact pullouts, use of photography and customer proofing, we were able to achieve this. We built specific document and client areas, accessible only by logged in users. Each user also sees content tailored to the company they are from. This was a fantastic feature to get in place, and adds a layer of customer care that will save employees time, and make them feel cared for. The team at Digital Elite has written some fantastic and informative content which was ready to go for launch. To make the most of this, we designed a minimalist blog homepage – which features just the post title, nothing distracting or crammed in. The result has been an ever evolving website, with a constantly evolving focus on personas. Since launching, Digital Elite has provided unique logins to a number of their clients and has seen great success from it. To view the Digital Elite website, just click HERE.